there is no better place to enjoy your dream Samui holiday ! 3 fabulous bedrooms. 2 stunning beach side properties. 1 spectacular beachfront location that holiday dreams are made of ! If you love the beach and are traveling with a group of family or friends, then making a decision on where to stay to get the most out of a beach loving holiday really is as easy as counting to 1,2,3 with this brilliant property on offer to you for a very fabulous price ! 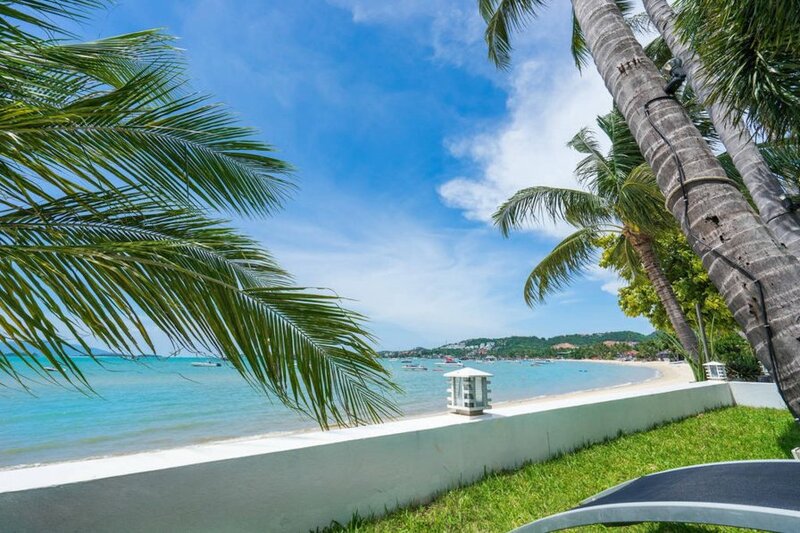 Located directly on the pristine and white sands of Bangrak beach, on the North-East coast of Koh Samui, with the azur tones of the sea lapping gently away only a stones throw from your terrace, this is an ideal spot for beach lovers or those who enjoy magnificent sunset ocean vistas. Two separate properties, offering a combined total of 3 bedrooms, 2 fully equipped kitchens, 3 bathrooms, 2 indoor living areas and multiple outdoor living areas – as well as the beach in your front garden- ensures that this quaint and idyllic property brings groups of family and friends together, whilst still allowing enough breathing space for privacy when it is favourable. The first villa is an open plan bedroom, living area, kitchen and dining room with a separate bathroom. The second villa, only 30 seconds walk away, houses one Kingsize ensuite bedroom, a twin bedroom with a bathroom right outside and an open plan kitchen, living and dining area.The Master Kingsize bedroom is located on the beach side of the property, and features patio doors which can be opened wide so you can lie back in bed and allow the ocean breeze to cool you and tempt you into a snooze, and you need never miss a moment of the delightful views. The twin bedroom is located next door to the Master room, offering a perfect set-up for parents who like to keep an ear on their little ones. 4 foldaway beds can be added (2 in each property) to bring the maximum occupancy available here up to 10 guests – plus 2 baby cots for infants under 2 years old. Both open plan lounge and kitchen areas feature flat-screen TVs, with access to cable channels, DVD players, dining and lounge seating and have floor to ceiling patio doors all along the beach side of the property, which can open wide to allow the wonderful sea-breezes in and offer unobstructed fantastic ocean views. The kitchens are fully equipped.. although with the sumptuous array of dining options only minutes walk from the property, it may be more tempting to allow the professionals to tickle your taste buds and pamper you while you stay here! The quirky decor you will find here is very unique, and as well as being fun, proves that simple can also be luxurious – the neutral palette of pale hues mixed seamlessly with vibrant splashes of tropical colour and adorned with unusual furnishings and artifacts from the world over give these two beautiful villas their character, and blends them harmoniously with the stunning natural surroundings. Despite being only a short walk along the beach from a number of attractions and restaurants, the charm of the terraces and outdoor living areas and amazing views that come with this property may make you hesitant to ever leave! The property features covered outdoor terraces, a grassy lawn area, utterly comfortable hammocks, sun beds, an outdoor lounge area, a roof-top sala and outdoor dining options – some with full shade and some in full sun, and of course, direct access to the beautiful beach it is located on. The property is only a 2 minute walk to a first-class hotel, which opens its doors to guests for sumptuous dining options, well deserved spa treatments or a day lounging beside their swimming pool. Very close by, within walking distance, there are many more dining and shopping options, and even restaurants that will deliver directly to your door! Many of the attractions Koh Samui offers its visitors are located within 10-15 minute drive. Whether you want to explore the area or just get the very most out of your beach side retreat, this quaint property will provide the ideal setting. Sitting directly on the gorgeous sands of Bangrak Beach this simple three bedroom property offers a haven of retreat to groups of friends or small families. This is quirky, vibrant and ultimate beachfront luxury – a slice of paradise on it’s doorstep to beach lovers and those who will enjoy the phenomenal ever changing sunset and ocean views. Guests of this property are meant to experience outdoor living at its finest – fabulous beach side relaxation! For smaller groups traveling together, there may be possibilities to rent only one of the villas, for a reduced rate. Please contact us for more information.